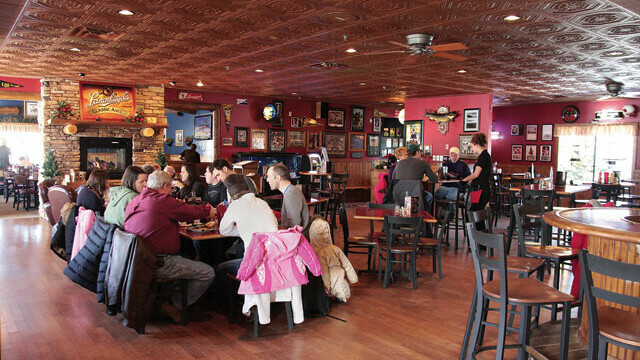 This casual, family-friendly restaurant and sports bar has an old-school antique feel. It boasts a unique menu that includes local cuisine and unique appetizers like Leinenkugel's battered pickles, Shrimp Kisses, and Rumor Stoppers (a hard boiled egg wrapped in bacon and deep fried with a sweet chili sauce), as well as hand-crafted ice creams. Weather permitting, you can enjoy dinner on the outdoor patio. Lunch buffet and Friday fish fry. A fellow Klein Hall veteran took me to my first ever Rumor Mill Pub & Eatery lunch buffet meal. I'd give this place Five Stars but I'll just have to return again, and again and again....Outdoor seating available. Located near the Micon theater and Veterans "CBOC" health clinic. Real good food with reasonable prices. Thanks for a job well done. The service has been a 50/50 shot, one night we wanted to catch a movie and ordered food one hour before it started and missed the movie - they were not even close to full! I am pretty sure the server or kitchen lost the order. We tend to steer clear if possible. My first clue should have been on a Saturday night we could sit in a booth, table or a high top.....no waiting. Can you say Perkins with booze? Boring boring food, I don't think I will ever go back. Husband ordered me pasta to from here. 17 dollars for Alfredo with chicken and broccoli (he didn't notice the "add on" charges on the menu until it was too late). Chicken was diced and tasted processed. Broccoli was scarce and almost shredded. "Alfredo" sauce tasted awful. This is not an exaggeration, I have had better pasta at Fazoli's. Stick to the beer here.